The one-two punch of the world economic slowdown and hurricane Michelle pummeled a Cuban economy already weakened by the loss a decade earlier of trade and economic assistance from the former Soviet Union and the socialist countries. In the early 1990s, Cuba plunged into a deep economic crisis that affected nearly all sectors of the economy and sharply reduced population consumption levels. Consistent with its proclivity to use military symbols to rally the population, the Cuban leadership referred to this economic crisis as “a special period in time of peace,” a national emergency occurring in peacetime but with potential consequences for the survival of the regime as serious as those of a war. After four consecutive years of economic contraction, the Cuban economy began to record positive growth in 1994, a trend that continued through 2001. Nevertheless, Cuban gross domestic product and many other economic indicators have yet to reach their precrisis levels. The fragile recovery of the Cuban economy in the second half of the 1990s is seriously threatened in mid-2002 by several exogenous shocks that have added pressure to an already-stressed external sector, presaging the continuation of the special period for the foreseeable future. The first part of the paper reviews very briefly the performance of the Cuban economy in the 1990s. The second part summarizes the Cuban government’s tentative and inadequate policy responses. The third part discusses developments that have complicated Cuba’s economic situation in 2002 and support the proposition that there is no end in sight for the special period. • The hard currency international debt increased by nearly 42 percent. Physical production of all key agricultural and industrial products reported in Table 1 (with the exception of crude oil production) fell between 1989 and 1993, translating into sharp reductions in consumption and population standard of living. Of the products listed in the table, particularly significant were the declines in output of paper (89 percent), cement (72 percent), steel (69 percent), beer (61 percent), cereals (61 percent), milk (57 percent) and fish catch (51 percent); production of sugar cane (agriculture) fell by 43 percent and of sugar (industry) by 44 percent. The economic slide apparently ended sometime around mid-1994, and according to official Cuban statistics, GDP grew by 0.7 percent in 1994. 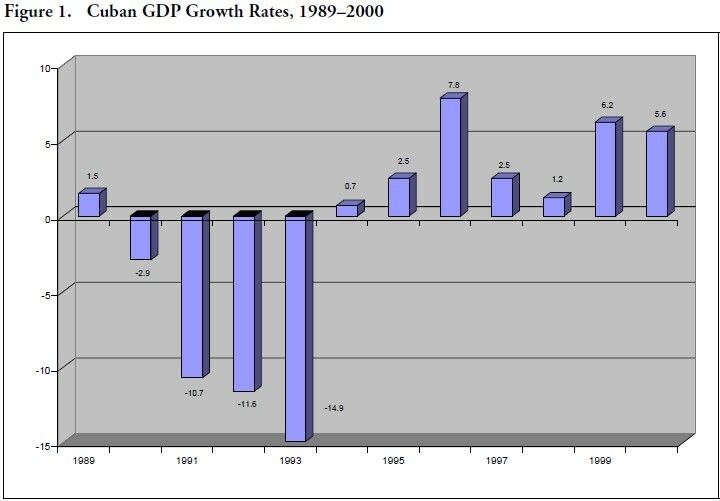 Cuba has recorded positive growth in every year since 1994, although the growth rate has fluctuated significantly from year to year (see Figure 1). Over the period 1993-2000, GDP grew by 29.7 percent, or at an annual average growth rate of 3.8 percent; over a like period, GDP per capita grew by 26.1 percent, or at an average annual rate of 3.4 percent. In 2000, however, Cuban GDP was still 15.4 percent below its level in 1989—the last year before the economic crisis struck—and GDP per capita 20.5 percent below. To further illustrate the sharp decline in investment, Table 2 shows the composition of merchandise imports in 1989-2000 by end use categories. In 1989, 10.4 percent of imports were consumption goods, 66.8 percent were intermediate goods for further processing and 22.8 percent were capital goods (investment goods) to support future production capabilities. During 1993-94, the peak years of the economic crisis, the share of consumer goods imports doubled to about 20 percent while the share of capital goods shrank to 3-5 percent. By 1999-2000, capital goods’ share of total imports had risen to over 13 percent, but was still significantly below its 1989 share, while consumer goods’ share was very high at over 20 percent. • The budget deficit fell from 33.5 percent of GDP in 1993 to 7.4 percent of GDP 1994— reflecting a remarkable reduction in government spending—and decreased subsequently to 2.0 percent of GDP in 1996, inching up to 2.4 percent of GDP in 1999 and 2000. Merchandise exports and imports recovered during the second half of the 1990s, with exports growing by 47.4 percent between 1993 and 2000, and imports by 144.4 percent during a like period. The much faster growth of imports relative to exports means that the merchandise trade deficit expanded significantly during this period, from 847 million pesos in 1993 to nearly 3.2 billion pesos in 2000. Although Cuba had very limited access to international credit markets in the 1990s (recall that Cuba defaulted on its hard currency debt in 1986 and credit has been limited to supplier loans and other instruments with very short maturity), the hard currency debt grew from $8.8 billion in 1993 to $11.0 billion in 2000 as a result of the accumulation of interest and shifts in the relative value of currencies in which the debt was contracted. Turning to specific sectors of the economy, physical production of most items in Table 1 recovered in the second half of the 1990s. Notable exceptions were sugar cane (agriculture), milk, sugar and paper production. Nickel and citrus, two sectors that received foreign capital (in the form of joint ventures between foreign investors and domestic enterprises), showed significant increases in production after 1993, with nickel output increasing by 136.4 percent—and reaching an all-time high in 2000 of 71,400 metric tons (MT)—and citrus by 39.2 percent. Oil production, another sector that has received foreign investment, continued to set records, reaching an all-time high output level of 2.7 million MT in 2000. For many of the products in Table 1, however, although production levels in 1999-2000 were higher than in 1993, they were still lower than in the precrisis year of 1989. This is the case, for example, for cement (2000 level of output was 56.6 percent below 1989), beer (39.7 percent below), and cigarettes (25.5 percent below). The most successful sector of the Cuban economy in the 1990s has been international tourism. In 1990, 340,000 foreign tourists visited the island, generating $243 million in convertible currency revenue6 (Table 3). While other sectors of the Cuban economy struggled in the early 1990s, the number of international tourist arrivals and tourism revenues increased steadily, with the number of international tourists more than doubling and revenues more than quadrupling between 1990 and 1995. Double-digit annual growth rates in both international tourist arrivals and revenue from tourism were the rule through 1998, albeit starting from a low base. Figure 3 compares the value of exports of the sugar industry (principally raw sugar and molasses) and revenue from international tourism for the period 1990-2000. The figure shows the precipitous drop in the value of exports of the sugar industry in the early 1990s as preferential relations with the former Soviet Union and the Eastern European socialist countries came to an end and the continuing downward trend, at the same time that revenue from tourism expanded steadily. 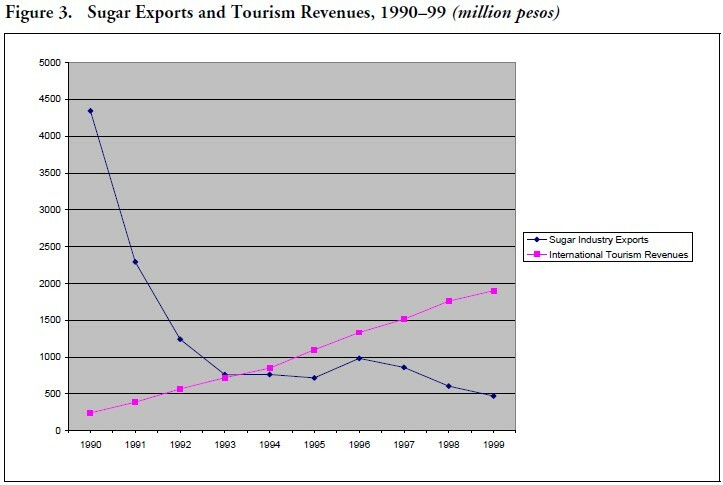 In 1993-94, tourism revenue overtook the sugar industry as the main generator of export revenue. Cuba’s macroeconomic situation in the early 1990s was dismal: large government budget deficits, very high levels of repressed inflation (expressed through physical shortages and rampant black markets, including a hard currency black market), large monetary balances in the hands of the population, serious balance of payment imbalances, and inability to borrow in international markets. The Cuban government’s initial response to the economic crisis brought on by the disruption of economic relations with the socialist countries was an economic austerity program to conserve energy and raw materials; a national program to increase food production; renewed efforts to secure new markets for exports; a campaign to attract foreign investment, particularly in the tourism industry; and some management reforms.8 At that point in time (1990), the Cuban leadership could not come to terms with the proposition that the political and economic changes that were occurring with lightning speed in Eastern Europe and the former Soviet Union were irreversible, and still harbored the illusion that the status quo ante of trade and economic support from the socialist bloc would be reestablished. The inadequacy of the initial Cuban government response—which lacked any meaningful policy reforms—is evident from the official statistics reported in the previous section. Legalization of the Holding and Use of Foreign Currencies: In the summer of 1993, Cuba decriminalized the holding and use of hard currency by Cuban citizens. The purpose of this action was two-fold: (1) to stem the booming hard currency black market; and (2) to stimulate hard currency remittances to Cuban citizens by relatives and friends living abroad in order to close the balance of payments gap. To give concrete meaning to this so-called “dollarization” policy, the government created special stores at which individuals holding hard currencies could shop for items not available to Cubans holding pesos and liberalized travel to the island by relatives and friends of Cuban citizens. Later, the government created foreign currency exchange houses (Casas de Cambio, CADECA) at which Cuban citizens could exchange hard currencies for pesos at rates close to those prevailing in the hard currency black market and facilitated remittances by easing the procedures for receiving foreign funds and allowing private foreign companies to carry out some of the transactions. Self-Employment: In September 1993 the Cuban government authorized self-employment in over 100 occupations, subject to some restrictions. The authorized occupations spanned home repair and transportation, agricultural and personal services. Among the restrictions on self-employment were, for example, that professionals holding a university degree could not become self-employed; similarly, since education and public health services continued to be supplied by the state, physicians, dentists, teachers, professors and researchers were excluded from self-employment altogether. Candidates for self-employment had to request a license, could not hire others, had to pay fees and taxes to the government, and were restricted how they sold the goods or services they produced. The list of occupations amenable to self-employment was expanded in October 1993 and in June 1995, bringing the total number of authorized occupations to 140. Agricultural Cooperatives: Also in September 1993, the Council of State approved breaking up large state farms into Basic Units of Cooperative Production (Unidades Básicas de Producción Cooperativa, UBPC). These UBPCs would have the use of the land they worked for an indefinite period of time, own the output they produced, have the ability to sell their output to the state through the state procurement system (acopio) or through other means, have their own bank accounts and be able to elect their own management. The rationale for the policy change was that the shift from state farms to cooperatives would give workers greater incentives to increase production with the least expenditure of material resources. Tax Code: In August 1994, the National Assembly approved a new and very broad tax code, to be implemented gradually beginning in October 1994. The new system levies taxes on the income of enterprises, including joint ventures with foreign investors, as well as on the value of assets owned; earned income; sales; consumption of products such as cigarettes, alcoholic beverages, electro-domestic appliances and other luxury goods; public services such as electricity, water and sewer, telephone, telegrams, transportation, restaurants and lodging; real estate holdings; gasoline- or draft animal-powered transportation vehicles; transfer of property, including inheritances; public documents issued; payrolls; and use of natural resources. The law also foresees employer contributions to social security, user fees on roads (tolls) and airport services, and charges for advertising of products or services. Agricultural Markets: Complementing the creation of the UBPCs, in late September 1994, Cuba authorized the creation of agricultural markets, locations at which producers of selected agricultural products could sell a portion of their output at prices set by demand and supply. In most respects, the agricultural markets authorized in September 1994 are similar to the farmers’ free markets (mercados libres campesinos, MLC) that were created in 1980 and scuttled in 1986. In October 1994 the Cuban government announced that it would also allow the free sale of a wider range of consumer products through a network of artisan and manufactured products markets. Foreign Investment Facilitation: In September 1995, the National Assembly adopted a new foreign investment law that codified the de facto rules under which joint ventures had been operating and introduced some innovations to the legal framework for foreign investment. For example, pursuant to the new law, 100 percent foreign ownership of investments would be permitted, up from the 49 percent allowed by the earlier statute. The new law also simplified the process for screening foreign investment, explicitly allowed foreign investment in real estate, and authorized the establishment of export processing zones. In June 1996 the Council of State implementing legislation creating export processing zones (zonas francas y parques industriales). Banking Reform: Long-expected legislation to reform the banking system was finally passed by the Council of State in May 1997. Decree-law No. 172 established the Cuban Central Bank (Banco Central de Cuba, BCC) as an autonomous and independent entity and assigned to it traditional central banking functions; the BNC was restructured to perform strictly commercial banking functions. Decree-law No. 173, passed at the same time, set out the legal framework for registration and operation of commercial banks and financial institutions under the supervision of the BCC. To summarize, in 1993 and 1994, Cuba took some steps to reduce the state’s role in the economy by legalizing the use of foreign currencies, liberalizing and expanding self-employment, reforming the structure of agricultural production and allowing the creation of some private marketplaces. In 1995-96 it liberalized foreign investment and created export processing zones. The Cuban government also took some tentative steps to restructure the economy, establishing a tax code in 1994 and reforming the banking system in 1997. Cuba has not undertaken liberalization measures since 1996, and those in 1995 and 1996 were tightly focused on foreign investment. • Output of the agricultural sector overall declined by 1.7 percent (a 10 percent growth in non-sugar agriculture had been projected). Even before the tragic September 11 events, the World Tourism Organization had revised down its estimates of industry growth to 2-3 percent as a result of the deceleration of the world economy and waning consumer confidence.20 World market prices for sugar and nickel, Cuba’s main export commodities, also weakened markedly in 2001: sugar world market prices, which had been around 10 cents/pound in the second half of 2000 and first quarter of 2001, fell to about 9 cents/pound in the second quarter of 2001, 8 cents/pound in the third, and 7 cents/pound in the fourth; nickel prices, which averaged $8638/metric ton in 2000, declined to $6551/metric ton in the first quarter of 2001, $6677 in the second quarter, $5495 in the third quarter, and $5056 in the fourth quarter. Further Reductions in Tourism: The aftermath of the terrorist attacks compounded the woes of Cuba’s tourism industry, particularly coming at a time when the island was preparing for the high tourist season, the time of the year when it receives the largest number of tourists. Gross revenue from tourism in 2000 was over $1.9 billion based on 1.774 million tourists and in 2001 about $1.8 billion based on 1.775 million tourists. The projected two million tourist arrivals would have meant revenue of about $2.2 billion (assuming the same expenditures per tourist as in 2000) and therefore actual revenues in 2001 were about $400 million off from the projection. The importance for Cuba of family remittances is evident in the public commitments President Castro made on November 2—as he prepared the population for more belt-tightening—when he pledged that despite the economic difficulties facing the nation: (1) the currency exchange outlets (CADECAS) would not be shut down; (2) all deposits in the banking system, whether denominated in pesos, convertible pesos or dollars would be absolutely respected; (3) hard currency stores would not be shut down; and (4) agricultural markets would continue to operate. 26 With these commitments, Castro hoped to raise the confidence of the remittances-sending community that recipients in the island would continue to be able to make use of the funds they received from abroad to gain access to products and services not available in peso-denominated markets. Enhanced Controls on International Financial Flows: One of the elements of the global campaign to root out international terrorism is to deny it financial means. The United States has taken a number of steps to freeze assets that terrorist organizations held in U.S. financial institutions. Several multilateral initiatives are also under way. While these actions do not directly involve Cuba, increased surveillance and control of international financial flows could have an adverse indirect impact on the island since they might affect investments of questionable origin. In the afternoon of November 4, Hurricane Michelle made landfall near Soplillar, a small town in the southern coast of Matanzas province near the Bay of Pigs. After landing, Michelle turned east and crossed the island at a slow pace, exiting on Monday morning, November 5, through the northern coast of Matanzas- Villaclara provinces, near the town of Corralillo. Industry: In all, 780 industrial plants were damaged throughout the country.39 The electricity distribution and communications systems were also severely affected by the hurricane. Michelle brought down 125 high-voltage electricity transmission towers in the center of the island, a large microwave retransmission tower associated with the telephone and television systems located near Jovellanos and two television towers, one in Cienfuegos and the other in Santa Cruz del Norte. Vice President Carlos Lage reported to the December 2001 session of the National Assembly that the factors that were pressuring the external sector were heavy indebtedness associated with the borrowing of funds in previous years to finance oil imports and the unfavorable performance of the five principal sources of foreign exchange: (1) tourism (reduced tourist arrivals); (2) sugar (damage to sugar cane crop from Hurricane Michelle and low world market prices); (3) nickel (low world market prices); and (4) tobacco (reduced world demand).43 The fifth source of income—not mentioned in the article—was undoubtedly family remittances. The long-term prospects of the Cuban economy hinge on whether the current economic model is maintained or is reformed to bring it closer to a market economy. The current economic model is simply not capable of generating sustained economic growth in the medium and long term.47 Further liberalization and restructuring of the economy are essential for generating vigorous and sustained future economic growth. The decade of the 1990s was a challenging one for the Cuban economy, weaned suddenly from the subsidies and preferential economic relations it had enjoyed with the former Soviet Union and the socialist countries for three decades. In 1990, Cuba entered what the leadership called a special period in time of peace as it tried to stop a free falling economy. Cuba began to generate positive economic growth in 1994 and has done so for the last eight consecutive years. By the end of the decade, most economic indicators showed improvement from 1993-94 levels, although they were considerably below their 1989 levels. Thus, the 1990s were a lost decade for Cuba in terms of economic growth. During the economic crisis of the 1990s, Cuba neglected investment in favor of consumption. This priority is readily observable in the low share of capital goods’ imports relative to consumption goods. The insufficient levels of investment will redoubt in low growth rates in the future and the inability to pull the economy out of the low-growth trap in which it currently operates. In 2002, Cuba faces an economic conundrum: a weak recovery after a deep economic crisis and very tight constraints on external resources, worsened by external shocks such as the world economic slowdown, the September 11 terrorist attacks, the Russian withdrawal from the Lourdes Radar Base and Hurricane Michelle. Absent meaningful reforms that liberalize and restructure the economy, there is no end in sight for the special period. Until such reforms take place, the Cuban population will continue to experience economic hardships. 1. This paper is a revised and updated version of “El período especial interminable de la economía cubana,” presented at a conference on Cuba sponsored by the Center for International Studies, El Colegio de Mexico, March 15, 2002, forthcoming in Foro Internacional. The paper expresses only the views of the author. 2. Fidel Castro, “Estamos más unidos y fuertes que nunca y mucho mejor preparados para enfrentar esta situación,” Granma (4 November 2001), www.granma.cubaweb.cu/2001/11/04/nacional/articulo16.html. 3. Carlos Lage, ¡Un pueblo unido puede vencer las mayores adversidades!,” Granma (11 November 2001), www.granma.cubaweb.cu/ 2001/11/11/nacional/articulo05.html. 4. Claes Brundenius and Pedro Monreal González, “The Future of the Cuban Model: The Longer View,” p. 130. In Claes Brundenius and John Weeks, editors, Globalization and Third World Socialism (Houndmills, Great Britain: Palgrave, 2001). 5. World Bank, Building Institutions for Markets: World Development Report 2002 (New York: Oxford University Press for the World Bank, 2001), pp. 235-237. 6. Cuba produces two series of tourism revenue figures, one that should be more properly called gross revenue from tourism and includes, in addition to visitors’ receipts, revenue from other activities related to tourism such as international communications, aviation, and so on. The second series, more properly called net revenue from tourism, excludes the additional activities. Cuban government officials and some analysts use the series interchangeably, often resulting in incorrect analysis of the situation. See María Dolores Espino, “Cuban Tourism: A Critique of the CEPAL 2000 Report,” in Cuba in Transition—Volume 11 (Washington: Association for the Study of the Cuban Economy, 2001), especially pp. 344-346. 7. Paolo Spadoni, “The Impact of the Helms-Burton Legislation on Foreign Investment in Cuba,” in Cuba in Transition—Volume 11 (Washington: Association for the Study of the Cuban Economy, 2001), p. 21. 9. For full description and evaluation of the measures see Carmelo Mesa-Lago, Are Economic Reforms Propelling Cuba to the Market? (Coral Gables, Florida: North-South Center, University of Miami, 1994) and Omar Everleny Pérez Villanueva, “Cuba’s Economic Reforms: An Overview,” in Jorge Pérez-López and Matías Travieso-Díaz, editors, Perspectives on Cuban Economic Reforms (Tempe, Arizona: Arizona State University Center for Latin American Studies Press, 1998). 10. Archibald R.M. Ritter, Cuba’s Economic Reform Process, 1998: Paralysis and Stagnation?, Department of Economics and School of International Affairs, Carleton University, mimeo (July 8, 1998). 11. Some of these reforms have been advocated by economists within the island. See, e.g., Julio Carranza Valdés, Luis Gutiérrez Urdaneta and Pedro Monreal González, “Reforming the Cuban Economy: A Proposal,” in Jorge F. Pérez-López and Matías F. Travieso- Díaz, editors, Perspectives on Cuban Economic Reforms (Tempe, Arizona: Arizona State University Center for Latin American Studies Press, 1998). 12. E.g., Raisa Pagés, “Estabilidad económica en los últimos cinco años,” Granma Internacional Digital (22 December 2000), www.granma.cu. 13. Banco Central de Cuba, Cuban Economy in the Special Period 1990-2000 (La Habana, n.d.). 14. Banco Central de Cuba, Cuban Economy in the Special Period 1990-2000 (La Habana, n.d.), p. 10. 15. Domingo Alberto Rangel, “Cómo superó Cuba una crisis,” Granma Internacional Digital (20 April 2001), www.granma.cu. 16. José Alejandro Rodríguez, “Crece la economía,” Juventud Rebelde (8 January 2001), www.jrebelde.cubaweb.cu. 17. These targets are taken from Carmelo Mesa-Lago, “The Cuban Economy in 1999-2001: Evaluation of Performance and Debate on the Future,” in Cuba in Transtion—Volume 11 (Washington: Association for the Study of the Cuban Economy, 2001), p. 12. 18. 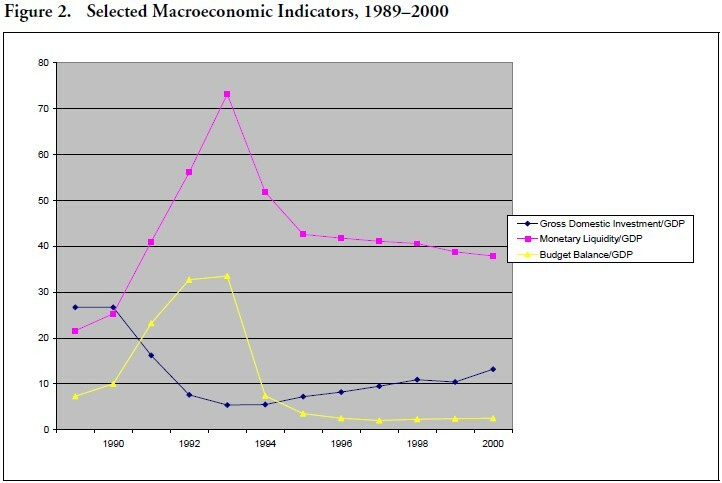 These results come from Comisión Económica para América Latina y el Caribe, Cuba: Evolución Económica Durante 2001, LC/ MEX/L.525. México (6 June 2002). 19. Analyst Pablo Alfonso suggested in October 2001 that a new special period may be in the offing. See Pablo Alfonso, “A las puertas de otro período especial,” El Nuevo Herald Digital (31 October 2001), www.elherald.com. 20. World Tourism Organization, The impact of the attacks in the United States on international tourism: An initial analysis (Madrid, September 18, 2001), at www.world-tourism.org. 21. “Cae inversión extranjera en América Latina,” Comunicado de Prensa, Comisión Económica para América Latina y el Caribe (17 June 2002). 22. MSNBC/Reuters, “Foreign investment in Cuba falls, EU wants reforms,” (8 July 2002), http://famulus.msnbc.com/FamulusIntl/ reuters07-08-090224.asp?reg=AMERICAS. 23. The 1999 and 2000 figures are from Oficina Nacional de Estadísticas (ONE), Anuario Estadístico de Cuba 2000 (La Habana: ONE, 2001), p. 128. The estimate for 2001 is from Comisión Económica para América Latina y el Caribe, Cuba: Evolución Económica Durante 2001. 24. Comisión Económica para América Latina y el Caribe, La economía cubana: Reformas estructurales y desempeño en los noventa (Mexico: Fondo de Cultura Económica, 2000). Based on the ratio of remittances to transfers for each of the years 1995-98. 25. 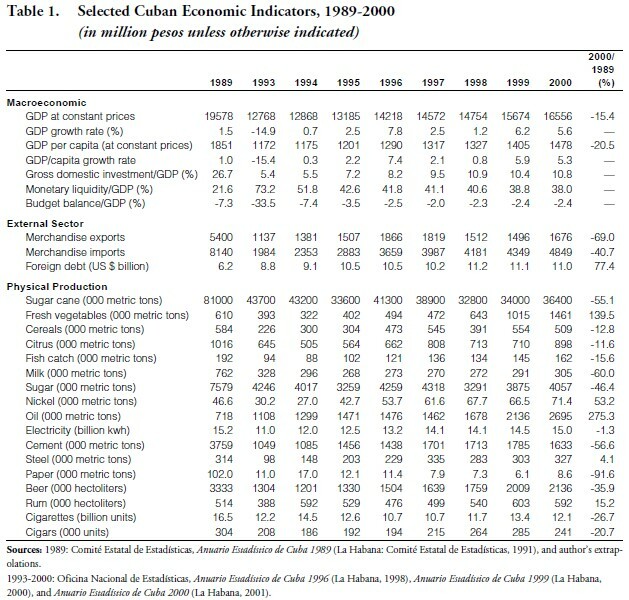 Comisión Económica para América Latina y el Caribe, Cuba: Evolución Económica Durante 2001, Table 17. For earlier years, CEPAL estimated the following flow of remittances: $537 million in 1995, $630 in 1996, $670 in 1997, $690 in 1998, and $700 in 1999. 26. “Estamos más unidos y fuertes que nunca y mucho mejor preparados para enfrentar esta situación,” Granma (4 November 2001), www.granma.cubaweb.cu/2001/11/04/nacional/articulo16.html. 27. Consultores Asociados, S.A., Cuba: Inversiones y Negocios, 1995-1996 (La Habana: CONAS, 1995), p. 18. 28. See, e.g., Gerardo Reyes, “Un poderoso narco pagó millones a Cuba,” El Nuevo Herald (10 December 2001), p. 29A, referring to activities of Mexican drug trafficker Amado Carrillo Fuentes. See also allegations of activities in Cuba by Russian organized criminals in Robert I. Friedman, Red Mafiya (Boston: Little, Brown and Co., 2000), p. 169. 29. Susan B. Glasser, “Russia to Dismantle Spy Facility in Cuba,” The Washington Post (18 October 2001), p. A34; Nancy Sar Martin, “Russia closing huge eavesdropping site in Cuba,” The Miami Herald (18 October 2001), pp. 1A, 2A; Pablo Alfonso, “Moscú retira su base de Cuba,” El Nuevo Herald (18 October 2001), pp. 1A, 2A. 30. “El embajador ruso en La Habana ratifica cierre de base de escucha,” El Nuevo Herald (24 October 2001), www.miami.com/ elnuevoherald. 31. “¡Un pueblo unido puede vencer las mayores adversidades! ¡Lo haremos,!” Granma (11 November 2001), www.granma.cubaweb. cu/2001/11/11/nacional.articulo5.html. 32. “Tenemos soluciones para cada situación,” Granma (19 December 2001), www.granma.cubaweb.cu/2001/12/20/nacional/ articulo12.html. 33. Comisión Económica para América Latina y el Caribe, Cuba: Evolución Económica Durante 2001, p. 8. 34. “Michelle dañó más de la mitad de la caña,” El Nuevo Herald (10 December 2001), p. 28A. 35. “Adelantan el inicio de la próxima zafra,” El Nuevo Herald (21 November 2001), www.elherald.com. 36. “Tenemos soluciones para cada situación,” Granma (19 December 2001), www.granma.cubaweb.cu/2001/12/20/nacional/ articulo12.html. 37. “Adelantan el inicio de la próxima zafra,” El Nuevo Herald (21 November 2001), www.elherald.com. 38. “Tenemos soluciones para cada situación,” Granma (19 December 2001), www.granma.cubaweb.cu/2001/12/20/nacional/ articulo12.html. 39. Pablo Alfonso, “Cuba: El duro azote del huracán,” El Nuevo Herald (9 November 2001), p. 1A. 40. “Tenemos soluciones para cada situación,” Granma (19 December 2001), www.granma.cubaweb.cu/2001/12/20/nacional/ articulo12.html. 41. Pablo Alfonso, “Cuba: El duro azote del huracán,” El Nuevo Herald (9 November 2001), pp. 1A. 42. Fidel Castro, intervention before the National Assembly, as given in María Julia Mayoral, Félix López and Juan Varela Pérez, “Lidiaremos con éxito contra todas las tempestades,” Granma Digital (22 December 2001), www.granma.cubaweb.cu. 44. Pablo Alfonso, “Cuba tendrá que pagar por adelantado el crudo de Venezuela,” El Nuevo Herald (7 July 2002). 45. Marc Frank, “Cuban Peso Under Increasing Pressure,” Reuters (10 July 2002). 46. Pablo Alfonso, “Castro necesita más dólares del exilio,” El Nuevo Herald (23 June 2002). 47. This point is also made by Brundenius and Monreal: “…in the absence of economic reforms directed towards the development of a sizable domestic non-state productive sector, sustained high economic growth should not be expected in Cuba.” Claes Brundenius and Pedro Monreal González, “The Future of the Cuban Model: The Longer View,” p. 148.